A few days ago, electronic voting made ​​its debut in Panama. The country not only joined the Latin American elite with automated elections, but it also became an example of inclusion for the region and the world, selecting an indigenous region as the premier location to use electoral technology for voting. The decision of the Electoral Tribunal (TE) was that the Comarca Ngäbe-Buglé would elect the General Cacique, three Regional Chiefs, seven local chiefs and the Buglé Special Cacique through an electronic voting system designed by the government, in order to extend its application to the whole country from 2016. The process was carried out specifically in the table 298 provided in the school Quebrada Guabo, where there were 400 Indians eligible to vote. The system used is similar to that used in other countries: after identifying the voter, it receives a card to activate the machine with touch screen. According to TE, the machine displays on the screen voting options, and the voter must press the box of its choice and then press the signal to continue, until finishing with the different ballots. In the event that the voter is wrong, he or she must touch the cancel option and repeat the procedure. If the citizen does not want to exercise his or her vote for any of the disputed charges, he or she can select the blank ballot option, and at the end, the machine will print the ballots in a paper voucher to be deposited in an urn. The dynamics of electronic voting was so simple and efficient that the Electoral Tribunal reported no difficulties or complications to the voters. However, it is noteworthy that this was possible thanks to the training program of the voting population, which could even refresh their memory before voting, using machines arranged in the polling place for this purpose. Given the results, election officials described the process as successful, because although electronic voting was implemented in just one of the 337 tables, optimal performance was both technically, and logistically, in terms of knowing the count, was also positive as it took less than an hour after the closing of the table. The Panamanian experience puts to the test many Latin countries, as it not only ventured to make an automated voting experience, but also defeated in the first attempt, the fear of exposing a population with different levels of instructional technology. Panama gambled and won, and now travels at a steady pace toward the modernization of the vote. Colombia suffered last year profound, even shocking failures in the elections that were run. Several days were delayed to announce the results, the website of the National Registry was affected and signatures were forged to register candidates, being those the vices that took a clean sweep of the public and media arena, and presented without fuss, the shortcomings of manual voting. After the events, political parties and citizens were open to proposals to improve the electoral system, but nothing happened. Another election run gad to come, the next 30th of October, when governors, mayors, councilors and mayors will be elected in the midst of a wave of violence, so that the authorities would focus once again on the regulation of elections. The government will deliver to Congress in the coming days a new electoral code that will implement all the rules issued more than 15 years ago, including electronic voting. If the legislation is passed, it would be implemented in the 2014 elections, and its main thrust would be the automation of the vote. With the legal reform expected, Colombia faces once again the possibility of overcoming the challenge of modernizing the electoral system and voting mechanisms. The Act to implement the process has been in force since 2004 and its application is years behind schedule, but the political will has not been adjusted to the national need and the requirements of the citizens. Now, its just left to t wait if the authorities make a decisión and stop settlling with questionable election results that are challenged from all sides, when the country can guarantee safe, transparent and timely results. The cards are dealt. Automated voting can give Colombia a three-way win: elect the people in the posts those who obatined the real majority, to annul the cheaters and encourage voting, because a proper system will engage more citizens in the exercise of Democracy. The rudimentary mechanism to count votes marked on paper or billboards acrylic bars may be coming to an end. Institutions such as universities, conducting elections to choose officials and student representatives, and usually use paper and pencil, they begin to migrate to electronic voting machines. The qualitative leap, not only represents an opportunity to study houses to make quick and fair elections, but it opens a gap for voting technology companies to create teams to target this market, or generate alternative options such as renting this voting machines.Thus, the electronic voting expands, bringing to the fore new ways of organizing institutional stability and balance. One of the first experiences was administered by the University of Distance Education (UNED) in Spain, where the hand of Indra, conducted the first election of the faculty in a totally electronic way. Then the company’s systems have been used for the election of student delegates. 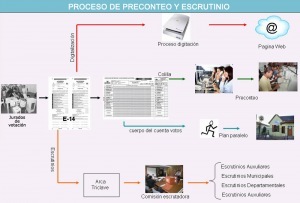 This process was advanced in June 2010, and the votes were encrypted and transmitted automatically to the electronic voting platform facilitating the business of technology. Voters agreed to the platform by a smart card, or through passwords, specially equipped for these elections. About 3,000 people, including teachers and administrative personnel and services, could see the benefits of this mode of voting when electing new members of the highest representative body of the university community. In June 2011, were crystallized an example of collaboration of the electoral institution in the state of Zacatecas, Mexico and the Autonomous University of Durango, Zacatecas Campus. To process electronic voting machines were installed two to 442 students and called for the election of the queen from that institution. The results were obtained in three hours. Also in June this year at the University of the Americas (UDLA) in Ecuador, was elected President and Vice President of Student Association, for the first time, the activity is conducted through electronic ways, for which set up 23 polling stations. Another example of institutional automation could be staged on November 15, 2011 by students of the Universidad Nacional Autonoma de Honduras (UNAH). At that time directives associations elect Colleges and Regional Centers and representatives to the University Council, for which provide for the inclusion of independent candidates, the crossing of the vote among the various levels elective gender equity with a requirement of 50% of female students in all the forms, the social audit by the accreditation of observers and transparency in the accountability for handling funds. To achieve this objective, analyze the implementation of electronic voting, and now a company that has provided services in Venezuela and Bolivia were given a demonstration. The decision is to be taken.